A mouse model of cerebral ischemia-reperfusion is established to investigate the pathophysiology of stroke. We distally ligate the right middle cerebral artery and right common carotid artery and restore blood flow after 10 or 40 min of ischemia. Chen, C. Y., Chen, R. J., Lee, G. A. Two-vessel Occlusion Mouse Model of Cerebral Ischemia-reperfusion. J. Vis. Exp. (145), e59078, doi:10.3791/59078 (2019). In this study, a middle cerebral artery (MCA) occlusion mouse model is employed to study cerebral ischemia-reperfusion. A reproducible and reliable mouse model is useful for investigating the pathophysiology of cerebral ischemia-reperfusion and determining potential therapeutic strategies for patients with stroke. Variations in the anatomy of the circle of Willis of C57BL/6 mice affects their infarct volume after cerebral-ischemia-induced injury. Studies have indicated that distal MCA occlusion (MCAO) can overcome this problem and result in a stable infarct size. In this study, we establish a two-vessel occlusion mouse model of cerebral ischemia-reperfusion through the interruption of the blood flow to the right MCA. We distally ligate the right MCA and right common carotid artery (CCA) and restore blood flow after a certain period of ischemia. This ischemia-reperfusion injury induces an infarct of stable size and a behavioral deficit. Peripheral immune cells infiltrate the ischemic brain within the 24 h infiltration period. Additionally, the neuronal loss in the cortical area is less for a longer reperfusion duration. Therefore, this two-vessel occlusion model is suitable for investigating the immune response and neuronal recovery during the reperfusion period after cerebral ischemia. 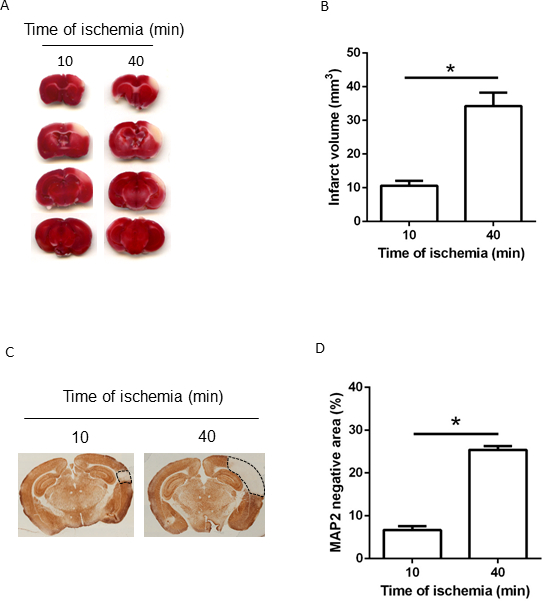 The cerebral ischemia-reperfusion mouse model is one of the most widely used experimental approaches for investigating the pathophysiology of ischemia-induced brain injury1. Because cerebral ischemia-reperfusion activates the peripheral immune system, peripheral immune cells infiltrate into the ischemic brain and cause neuronal damage2. Thus, a reliable and reproducible mouse model that mimics cerebral ischemia-reperfusion is required to understand the pathophysiology of stroke. C57BL/6J (B6) mice are the most commonly used strain in stroke experiments because they can easily be genetically manipulated. Two common models of MCAO/reperfusion that mimic the condition of cerebral ischemia-reperfusion are available. The first is the intraluminal filament model of proximal MCAO, where a silicon-coated filament is employed to intravascularly occlude the blood flow in the MCA; the occluding filament is subsequently removed to restore blood flow3. A short occlusion duration results in a lesion of the subcortical region, whereas a longer occlusion duration causes infarcts in the cortical and subcortical areas. The second model is the ligation model of distal MCAO, which involves extravascular ligation of the MCA and CCA to reduce the blood flow through the MCA, after which blood flow is restored through the removal of the suture and aneurysm clip4. In this model, an infarct is caused in the cortical areas, and the mortality rate is low. Because the ligation of MCAO/reperfusion model requires craniectomy to expose the site of the distal MCA, the site can be easily confirmed, and examining whether the blood flow in the distal MCA is disrupted during the procedure is straightforward. B6 mice exhibit considerable variations in the anatomy of their circle of Willis; this might affect the infarct volume following cerebral ischemia-reperfusion5,6,7. Currently, this problem can be overcome through ligation of the distal MCA8. In this study, we establish a method for occluding the MCA blood flow and enabling reperfusion after a predetermined period of ischemia. Two-vessel occlusion of the cerebral ischemia-reperfusion model induces transient ischemia of the MCA territory through ligation of the right distal MCA and right CCA, with blood flow restored after a certain period of ischemia.This MCAO/reperfusion model induces an infarct of stable size, a bulk of brain-infiltrating immune cells in the ischemic brain, and a behavioral deficit after cerebral ischemia–reperfusion4. The institutional animal care and use committees of Academia Sinica and Taipei Medical University approved this protocol for the use of experimental animals. Provide the mice with free access to water and chow until the surgery. Autoclave the surgical tools and sanitize the surgery table and equipment using 70% ethanol. Wear a surgical mask and sterile gloves. Use a dry bead sterilizer to resterilize the surgical tools if multiple mouse surgeries will be conducted in one experiment. Anesthetize an 8- to 12-week-old mouse (mass: 25–30 g) by using 0.8% chloral hydrate, via an intraperitoneal injection. Make sure the anesthetized mouse does not have a pedal reflex (as tested using a firm toe pinch) after the anesthetization. Use vet ointment to prevent eye dryness for the mouse while it is under anesthesia. Use a noninvasive blood pressure system to monitor the mouse’s blood pressure. Use a physiological monitoring system to monitor its rectal temperature and arterial blood gases. Maintain the body temperature at 36.5 ± 0.5 °C. Subcutaneously inject the mouse with a prophylactic antibiotic (25 mg/kg cefazolin)8. Place the mouse in the supine position on the heating pad. Use electric clippers to expose the skin by shaving the mouse’s fur on the ventral neck region, as well as in the region between the right eye and right ear. Use epilating cream to clear the fur from the mouse’s body and disinfect the surgical site alternating scrbus with povidione-iodine and 70% ethanol. Use iris scissors to cut a 1 cm-long midline incision at the neck. Use iris forceps to carefully dissect the CCA free from the vagus nerves without causing physical injury. Use 5-0 silk sutures to isolate the CCA. Make a 0.3 cm incision in the scalp at the midpoint between the right eye and right ear. Use microscissors to cut the temporalis muscle to expose the zygomatic and squamosal bone. Under a stereo dissecting microscope, use a microdrill to create a 2 mm-diameter hole directly over the right-side distal MCA. Ligate the trunk of the right-side distal MCA using a 10-0 suture. Occlude the right-side CCA using a nontraumatic aneurysm clip. After either 10 or 40 min of ischemia, remove the aneurysm clips and suture to restore blood flow to the MCA and CCA. Use a suture clip to seal the skin incision on the head. Seal the cervical skin incisions using a single suture followed by closing neck skin with suture or staple9. Subcutaneously inject buprenorphine (0.1 mg/kg) for pain relief9. Maintain the mouse’s body temperature at 36.5 ± 0.5 °C on the heating pad until it has fully recovered from the anesthesia. Do not return the animal that has undergone surgery to the company of other animals until it has fully recovered. Do not leave the animal unattended until it regains sufficient consciousness. Place the mouse into the autoclaved cage so that it can freely access water and chow after it has fully recovered. Anesthetize the mouse with 0.8% chloral hydrate via an intraperitoneal injection. Use operating scissors to decapitate the animal. Expose the skull by using iris scissors to make an incision in the skin of the head. Use operating scissors to cut the anterior of the frontal bone. Use iris scissors to cut the skull along the sagittal suture. Use a bone rongeur to push aside the frontal and parietal bone and expose the brain. Use iris forceps to dissect the brain. Use a mouse brain matrix and razor blades to obtain 2 mm coronal slices. Stain the brain slices for 10 min at 37 °C with 2% 2,3,5-triphenyltetrazolium chloride (TTC) in 1x phosphate-buffered saline. Rinse the brain 2x with 10% formalin. Fix the brain in 10% formalin at room temperature for 24 h.
Arrange the sections on a clean plastic slide and orient the sections from rostral to caudal. Scan the slide using a scanner. Place a metric ruler and make sure it is visible in the scanned image. Flip the slide over and scan the reverse side. Calculate the infarction area of each section using ImageJ software. Open the image file and set up the scale for the image. Use freehand selection to select the infarct area. Use the regions of interest (ROI) manager to measure the area of interest. Sum the infarction areas for each section and multiply the result by the section thickness to estimate the total infarction volume. Use GraphPad Prism 6 to determine the statistical significance with Student’s t-test. NOTE: The error bars on the bar graphs represent standard errors of the mean (SEMs). Use G*Power 3.1 to calculate the appropriate sample size and perform a power analysis10. This MCAO/reperfusion procedure produced a cortical infarct in the vicinity of the right MCA and caused a behavioral deficit. Different degrees of ischemia-induced infarct volume (Figure 1A,B) and neuronal loss (Figure 1C,D) were created in the cerebral cortex of the right MCA area through an increase in ligation duration. This MCAO/reperfusion injury decreased the animal's locomotor activity at 48 h after the MCAO/reperfusion (Figure 2). A bulk of peripheral immune cells (CD45high cells) also infiltrated the ischemic brain (ipsilateral hemisphere) after the cerebral ischemia-reperfusion (Figure 3). In addition, we compared this two-vessel occlusion model with the MCAO model and found that the infarct volumes of these two models were not significantly different (Figure 4). The mortality rate was low (<5%) in the two-vessel occlusion mouse model of cerebral ischemia-reperfusion. We excluded mice from further analyses if excessive bleeding had occurred during the surgery. When the surgical procedures were correctly followed, the rate of animal exclusion due to excessive bleeding from craniectomy or MCA was less than 15%. Occlusion of the right MCA or CCA alone did not cause infarction. Figure 1: Infarct volume and neuronal loss are positively correlated with the length of the vessel occlusion. (A) Representative TTC stains of brain slices from mice, 24 h after the MCAO/reperfusion. The duration of the MCAO was 10 or 40 min. Data shown are representative of three independent experiments. (B) Quantification of infarct volume. The error bars represent SEMs; n = 8; *p < 0.05. (C) The MAP2 expression in B6 brains at 24 h after MCAO/reperfusion was determined using immunohistochemistry. MAP2-negative areas are enclosed by a dashed line in the representative image of MAP2 staining of the brain section. (D) Quantification of the MAP2 negative area. MAP2-negative area (%) = ipsilateral MAP2-negative area / contralateral hemisphere x 100; n = 3; *p < 0.05. Figure 2: Locomotor activity decreased after cerebral ischemia-reperfusion. (A) Locomotor activity was analyzed 48 h after the MCAO/reperfusion. The duration of the MCAO was 40 min. The data were recorded for 60 min in an open-field assay. Mice's tracking distances were analyzed using CleverSys TopScan 1.0. The sham control group was comprised of mice that had undergone the surgery without the occlusion of the MCA or CCA. (B) Quantification of the distance moved by the sham and the MCAO/reperfusion mice. The data are presented as mean ± SEM; n = 7; *p < 0.05. Please click here to view a larger version of this figure. Figure 3: Peripheral immune cells infiltrate into the ischemic hemisphere after cerebral ischemia-reperfusion. (A) Brain-inﬁltrating immune cells (CD45high cells) in the ipsilateral and contralateral hemisphere, at 24 h after the MCAO/reperfusion, were analyzed by ﬂow cytometry. The isolation of brain-infiltrating immune cells has been described in a previous study4. The duration of the MCAO was 40 min. (B) The quantification of brain-infiltrating immune cells in the ipsilateral and contralateral hemisphere, at 24 h after the MCAO/reperfusion. The data are presented as mean ± SEM; n = 4; *p < 0.05. 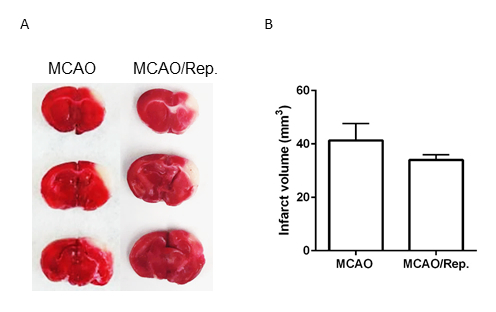 Figure 4: The infarct volume is not different between MCAO- and MCAO/reperfusion-induced injuries. (A) Representative TTC stains of brain slices from mice, 24 h after the MCAO. In the MCAO experimental group, the right MCA was permanently truncated using a vessel cauterizer, whereas the right CCA was transiently ligated for 40 min. In the MCAO/reperfusion (MCAO/Rep) experimental group, the procedure was as described in section 1 of the protocol. The duration of the MCAO was 40 min. (B) Quantification of infarct volume. The data are presented as mean ± SEM; n = 7. Table 1: Comparison of infarct volume and variability from different experiments. The infarct volume was determined at 24 h after the MCAO/reperfusion from three independent experiments. The duration of the MCAO was 40 min. SD = standard deviation; n = number of mice used per experiment. The MCAO/reperfusion mouse model is an animal model commonly employed to mimic transient ischemia in humans. This animal model can be applied to transgenic and knockout mice strains to investigate the pathophysiology of stroke. Several steps in the protocol are especially critical. (1) The microdrill must be carefully used when creating a hole in the skull, with inappropriate action easily causing bleeding from the MCA. (2) The MCA should not be damaged, and bleeding must be avoided before and after the ligation procedure. Damage to the MCA affects the level of reperfusion in the ischemic brain7. The MCA reperfusion status must be checked after the MCAO. The occlusion and restoration of blood flow to the MCA can be analyzed by using a laser Doppler. (3) The CCA should not bleed during the CCA isolation. (4) The vagus nerve must not be damaged during the CCA isolation because this could increase the infarct size and probability of mortality. (5) The body temperature of the mouse should be maintained at 36.5 ± 0.5 °C. Hyperthermia increases the infarct size and probability of mortality11. Hypothermia reduces the infarct volume after cerebral ischemia12. The significance of this MCAO/reperfusion model is that it can create highly reproducible cortical infarcts and behavioral deficits4. Compared with different MCAO models, such as the hypoxic ischemic (H/I) stroke model as described in a previous study8, this two-vessel occlusion model induces a relatively small variability in infarct volume (the coefficient of variation ranged from 0.11-0.17) (Table 1).Alternative stroke models, such as the intraluminal filament model, might result in an unpredictable infarct volume because of the uncertain status of the occlusion and reperfusion condition after surgery13. Compared with the three-vessel MCAO model (ligation of the right MCA and right and left CCAs)14, the proposed model involves the ligation of only two vessels (the right MCA and right CCA) to achieve cerebral ischemia. Consequently, a shorter surgery time is required than in the three-vessel MCAO model. The main limitation of this MCAO/reperfusion model is that it requires craniectomy to perform MCA ligation. One study indicated that craniotomy causes transcriptional changes in the brain15. Therefore, a sham control is required to determine the effects of MCAO/reperfusion on gene expression. Neuronal loss in the cortical area is less when a longer reperfusion duration is employed. Studies have demonstrated that the MAP2-negative area is smaller after 7 days of reperfusion, compared with 2 days of reperfusion4,16. However, this recovery effect is unlikely in a brain with ischemia induced by an intraluminal monofilament model of MCAO17,18. In addition, the intraluminal monofilament model of MCAO can sustain the infarct size for at least 7 days. B6 mice have extensive collateralization between the anterior cerebral artery and the MCA19. When we permanently truncated the MCA in the ischemic brain, we found that the infarct volume was not significantly different from the mice with a reperfused MCA at 24 h after the MCAO (Figure 4). Therefore, we suggest that the blood flow from the anterior cerebral artery collaterals might compensate for the ischemia effects of the MCA territory when the distal MCA is permanently occluded. In this study, the two-vessel MCAO/reperfusion model created an ischemia-reperfusion injury and caused peripheral immune cells to infiltrate into the ischemic brain. This model can be employed to investigate the interplay between the brain and the immune system. In addition, it can be used to test potential neuroprotectants or drugs that modulate the immune response after cerebral ischemia-reperfusion. This work was supported by the Ministry of Science and Technology, Taiwan (MOST 106-2320-B-038-024, MOST 105-2221-E-038-007-MY3, and MOST 104-2320-B-424-001) and Taipei Medical University Hospital (107TMUH-SP-01). This manuscript was edited by Wallace Academic Editing. Woodruff, T. M., et al. Pathophysiology, treatment, and animal and cellular models of human ischemic stroke. Molecular Neurodegeneration. 6, (1), 11 (2011). Chamorro, A., et al. The immunology of acute stroke. Nature Reviews. Neurology. 8, (7), 401-410 (2012). Engel, O., Kolodziej, S., Dirnagl, U., Prinz, V. Modeling stroke in mice - Middle cerebral artery occlusion with the filament model. Journal of Visualized Experiments. (47), e2423 (2011). Lee, G. A., et al. Interleukin 15 blockade protects the brain from cerebral ischemia-reperfusion injury. Brain, Behavior, and Immunity. 73, 562-570 (2018). Barone, F. C., Knudsen, D. J., Nelson, A. H., Feuerstein, G. Z., Willette, R. N. Mouse strain differences in susceptibility to cerebral ischemia are related to cerebral vascular anatomy. Journal of Cerebral Blood Flow and Metabolism: Official Journal of the International Society of Cerebral Blood Flow and Metabolism. 13, (4), 683-692 (1993). Kitagawa, K., et al. Cerebral ischemia after bilateral carotid artery occlusion and intraluminal suture occlusion in mice: evaluation of the patency of the posterior communicating artery. Journal of Cerebral Blood Flow and Metabolism: Official Journal of the International Society of Cerebral Blood Flow and Metabolism. 18, (5), 570-579 (1998). Wellons, J. C. 3rd, et al. A comparison of strain-related susceptibility in two murine recovery models of global cerebral ischemia. Brain Research. 868, (1), 14-21 (2000). Doyle, K. P., Fathali, N., Siddiqui, M. R., Buckwalter, M. S. Distal hypoxic stroke: a new mouse model of stroke with high throughput, low variability and a quantifiable functional deficit. Journal of Neuroscience Methods. 207, (1), 31-40 (2012). Doyle, K. P., Buckwalter, M. S. A mouse model of permanent focal ischemia: Distal middle cerebral artery occlusion. Methods in Molecular Biology. 103-110 (2014). Wayman, C., et al. Performing Permanent Distal Middle Cerebral with Common Carotid Artery Occlusion in Aged Rats to Study Cortical Ischemia with Sustained Disability. Journal Of Visualized Experiments. (108), e53106 (2016). Noor, R., Wang, C. X., Shuaib, A. Effects of hyperthermia on infarct volume in focal embolic model of cerebral ischemia in rats. Neuroscience Letters. 349, (2), 130-132 (2003). Florian, B., et al. Long-term hypothermia reduces infarct volume in aged rats after focal ischemia. Neuroscience Letters. 438, (2), 180-185 (2008). Carmichael, S. T. Rodent models of focal stroke: size, mechanism, and purpose. NeuroRx: The Journal of the American Society for Experimental NeuroTherapeutics. 2, (3), 396-409 (2005). Lin, T. N., Te, J., Huang, H. C., Chi, S. I., Hsu, C. Y. Prolongation and enhancement of postischemic c-fos expression after fasting. Stroke. 28, (2), 412-418 (1997). Glazier, S. S., O'Rourke, D. M., Graham, D. I., Welsh, F. A. Induction of ischemic tolerance following brief focal ischemia in rat brain. Journal of Cerebral Blood Flow and Metabolism: Official Journal of the International Society of Cerebral Blood Flow and Metabolism. 14, (4), 545-553 (1994). Tachibana, M., et al. Early Reperfusion After Brain Ischemia Has Beneficial Effects Beyond Rescuing Neurons. Stroke. 48, (8), 2222-2230 (2017). Gan, Y., et al. 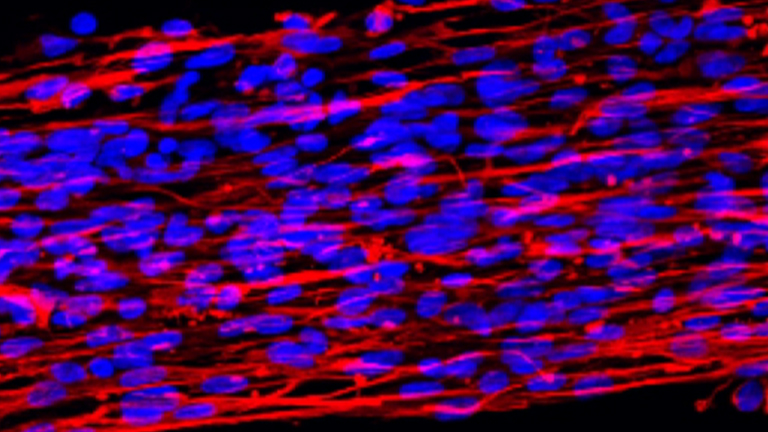 Ischemic neurons recruit natural killer cells that accelerate brain infarction. Proceedings of the National Academy of Sciences of the United States of America. 111, (7), 2704-2709 (2014). Li, M., et al. Astrocyte-derived interleukin-15 exacerbates ischemic brain injury via propagation of cellular immunity. Proceedings of the National Academy of Sciences of the United States of America. 114, (3), E396-E405 (2017). Wang, S., Zhang, H., Dai, X., Sealock, R., Faber, J. E. Genetic architecture underlying variation in extent and remodeling of the collateral circulation. Circulation Research. 107, (4), (2010).